"Our goal is early parliamentary elections." The former head of the Odesa Regional State Administration Mikheil Saakashvili unveiled plans to create an own political force. "We will create a new broad-based political force. Our goal is early elections," Saakashvili told a briefing on Friday, 11 November. There are young people, Saakashvili said, who want to change the country. The former governor promised that people who have worked in parliament more than one term and oligarchs will have no place in the new party. Saakashvili said he had repeatedly turned down the offers of President Petro Poroshenko to lead his BPP Solidarity party. "The president of Ukraine last year, while I was still working [as Odesa governor] has on more than one occasion offered me the post of prime minister of Ukraine or head of his party Solidarity. I refused and also declined to run in the list [of Poroshenko's party] in the Odesa region. 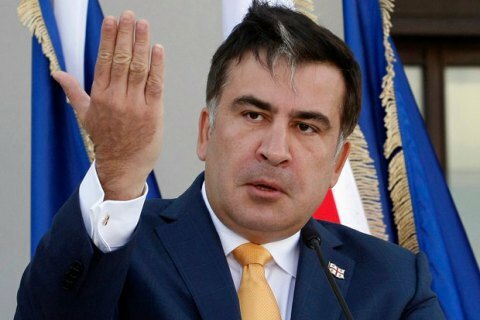 It was my conscious decision because all these parties, especially those associated with the government, are utterly clogged with rotten, anti-people elements," Saakashvili said. In July, former deputies of prosecutor general, David Sakvarelidze and Vitaliy Kasko, and MP Viktor Chumak announced the creation of the party titled Khvylya (Wave).